5" x 7" 6" x 8"
A gold coloured football plaque which is mounted on a veneered, mahogany effect, wooden board. 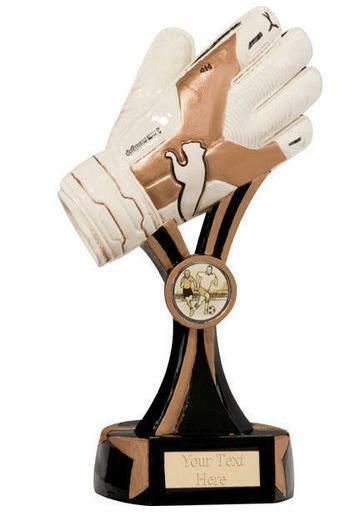 This award has been designed so that a gold plate can be attached in the space under the football design making it a versatile award that can be personalised for the Players Player, Top Goal Scorer, Man of the Match or given as a Birthday Gift personalised for any keen football player! It is available to buy in two sizes, 5" x 7" or 6" x 8"
We recommend engraving can be up to 5 lines of 15 characters per line including spaces. A Quality Black and Gold Resin Gaelic Football Archway Trophy. High quality Gold and Silver Football figure and cup resin trophy.